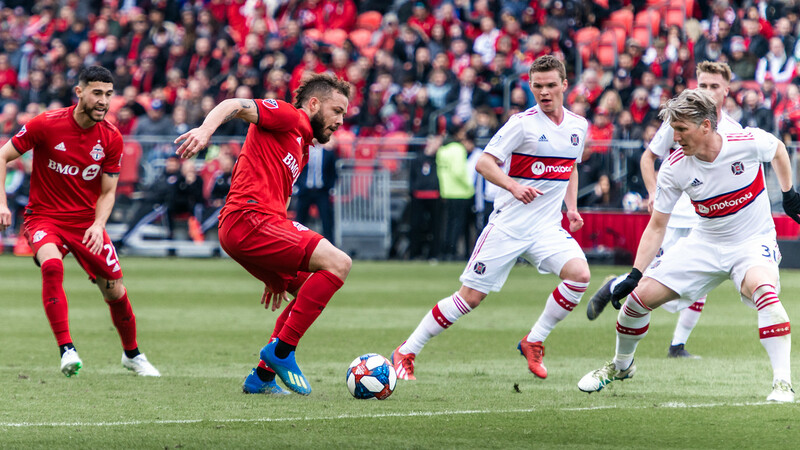 Toronto FC extended their unbeaten run this season as they drew the Chicago Fire 2-2 on Saturday afternoon. New signing and Toronto native Richie Laryea earned his first appearance with his hometown club, as he replaced Auro in the lineup who was dealing with a hamstring problem. The first chance of the game came to the Reds in the 20th minute when Alejandro Pozuelo played a ball towards Justin Morrow in the box who did well to keep it in and send in a cross which was headed clear by the Chicago defence. TFC made it 1-0 in the 31st minute when Jozy Altidore headed home a Pozuelo cross. Nick DeLeon did well to create space for himself before sending it to Pozuelo who linked up with Altidore for the second straight game. It is safe to say that “Jozuelo” will combine for a considerate amount of goals this season. The Fire tied it up in first half stoppage time when rookie Jeremiah Gutjahr played a long ball towards C.J. Sapong who controlled it well with his right foot, and shot it with his left over Alex Bono who was caught off his line. Altidore thought he had his second goal of the match when DeLeon sent a perfect cross onto his head, but his header was spectacularly saved by David Ousted. Chicago took the lead in the 62nd minute through Hungarian striker Nemanja Nikolić. Aleksandar Katai played a pass back into the middle of the box and Nikolic finished it with his left foot. Pozuelo earned a free kick after being fouled in the 71st minute, but his curling effort went just wide. Toronto salvaged a point in the 76th minute when Jonathan Osorio headed home the equalizer. Jozy Altiore turned and twisted his way along the end of the field before crossing it into Osorio. Toronto FC now have 10 points through four matches. Their next game is against the Seattle Sounders at CenturyLink Field on Saturday at 4 p.m.